Tameside Canal Boat Trust – Page 3 – Still Waters trip boat, Portland Basin, Ashton under Lyne. As well as Saturdays and Sundays, we are running boat trips on Tuesday 31st October, Wednesday 1st, Thursday 2nd & Friday 3rd November. 12.30, 1.30 & 2.30 pm from Portland Basin Museum. Adult £4; child £2. No need to book – pay on board. We are now on our Winter timetable. Trips start from Portland Basin Museum. No booking required but please phone to check availability before travelling from further away. 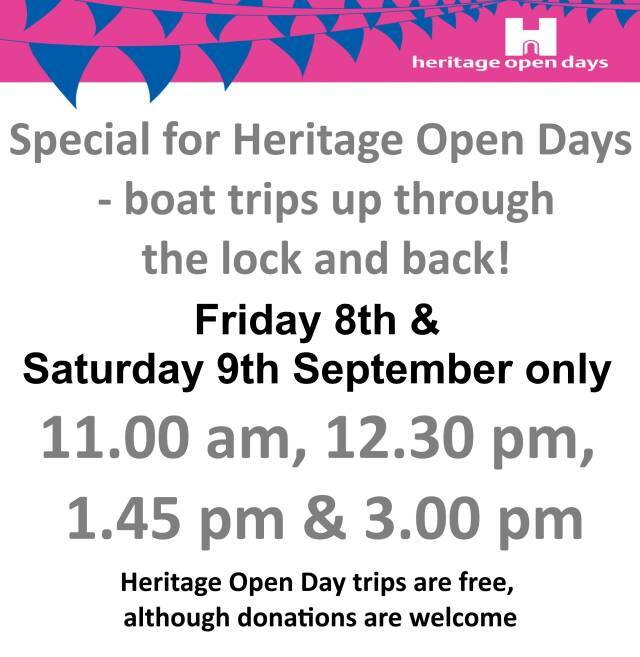 Our normal public trips do not include going through the lock, so this is an opportunity to experience something different! Public trips every day until 3rd September at 11.00 am, 12.30, 1.15, 2.00 & 2.45 pm. Adults £4, children £2. No need to book – pay on the boat. During the school holidays we will do our best to run boat trips every day (except when the museum is closed on Mondays). Trips at 11.15 am, 12.30, 1.15, 2.00 and 2.45 pm. No need to book. Please see our Facebook page for latest information.